For those cats that love their food but struggle to keep from piling on the pounds, Meowing Heads Fat Cat Slim Adult Chicken and Salmon Dry Cat Food offers the ultimate solution – a low-fat dish that is full of flavour. With 40% chicken and fish, this sumptuous meal seems too good to be true, but is ideal for those cats with a tendency to put on weight. It is grain-free, making it easy to digest, and contains a range of eΒential vitamins, minerals and trace elements to care for your cat's overall wellbeing. L-carnitine features in this recipe to give your cat's metabolism a well-needed boost, helping increase rates of fat burning. The recipe of this nutritious dry food contains only the finest 100% natural ingredients, all clearly stated and free from artificial colours, flavours and preservatives. This ensures your cat is receiving the benefits of the best quality nutrients, including chondroitin and glucosamine for joints strained by exceΒ weight, taurine for healthy heart and eyesight and cranberry extract for a healthy urinary tract. 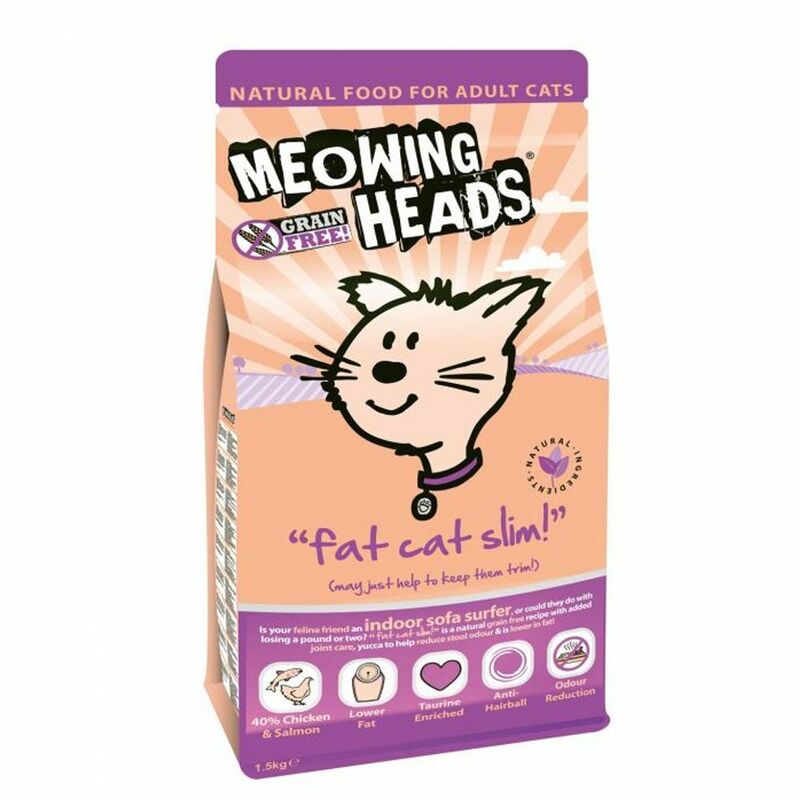 Meowing Heads Fat Cat Slim Adult Chicken and Salmon Dry Cat Food comes in modern, colourful packaging and can help keep your cat's weight at a healthier level. Meowing Heads Fat Cat Slim Adult – Chicken and Salmon at a glance: Reduced-fat dry food for adult cats prone to weight gain Specially-formulated recipe to help with weight management Grain-free: this makes it ideal even for sensitive cats with allergies or intolerances 100% natural: with high-quality, selected ingredients free from artificial colours, flavours and preservatives Lower fat content: than standard varieties of Meowing Heads dry cat food 40% chicken and fish: ensuring your cat receives optimum, controlled amounts of animal protein Well accepted: a particularly sumptuous recipe thanks to the use of premium natural ingredients Contains L-carnitine: the boost metabolism and increase fat-burning With chondroitin and glucosamine: to support joints and cartilage that may suffer from carry exceΒ weight Healthy gut flora: thanks to easy-to-digest high quality ingredients and plentiful fibre With taurine: an eΒential nutrient for keeping your cat's heart and eyesight strong Contains cranberry extract: a rich source of antioxidants Omega-3, omega-6 and zinc: to support healthy skin and gleaming fur Balanced recipe: with a wonderful range of valuable vegetables and plant extracts to provide vitamins, minerals and trace elements With seaweed: a natural source of calcium, vital for strong bones and teeth Yucca extract: can help reduce stool odour Made in the UK by premium pet food producer Barking Heads.